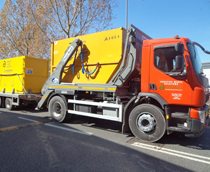 Using our modern fleet of vehicles and trained ADR drivers, AWS Ltd are able to supply enclosed lockable skips throughout the UK for the safe, secure storage of asbestos contaminated waste prior to disposal at a landfill. We offer a range of size skips from 2-40 cubic yards to suit all requirements for the disposal of all types of asbestos waste. At AWS Ltd, we also specialise in the disposal of asbestos contaminated soils using Tipper lorries or lined skips. All asbestos waste disposal services provided by AWS Ltd are fully documented ensuring environmental compliance and whilst offering a reliable, cost effective disposal solution, the standard of services provided by AWS Ltd to our customers, remains our priority.